The mind-set and tactics you employ to buy your first Aylesbury buy to let property needs to be different to the tactics and methodology of buying a home for yourself to live in. The main difference is when purchasing your own property, you may well pay a little more to get the home you (and your family) want, and are less likely to compromise. When buying for your own use, it is only human nature you will want the best, so that quite often it is at the top end of your budget (because as my parents always used to tell me – you get what you pay for in this world!). Yet with a buy to let property, if your goal is a higher rental return – a higher price doesn’t always equate to higher monthly returns – in fact quite the opposite. Inexpensive Aylesbury properties can bring in bigger monthly returns. Most landlords use the phrase ‘yield’ instead of monthly return. To calculate the yield on a buy to let property one basically takes the monthly rent, multiplies it by 12 to get the annual rent and then divides it by the value of the property. This means, if one increases the value of the property using this calculation, the subsequent yield drops. Or to put it another way, if a Aylesbury buy to let landlord has the decision of two properties that create the same amount of monthly rent, the landlord can increase their rental yield by selecting the lower priced property. Now of course these are averages and there will always be properties outside the lower and upper ranges in yields: they are a fair representation of the gross yields you can expect in the Aylesbury area. As we move forward, with the total amount of buy to let mortgages amounting to £199,310,614,000 in the country, landlords need to be aware of the investment performance of their property, especially in the era of tax increases and tax relief reductions. Landlords are looking to maximise their yield - and are doing so by buying cheaper properties. However, before everyone in Aylesbury starts selling their upmarket properties and buying cheap ones, yield isn’t the only factor when deciding on what Aylesbury buy to let property to buy. Void periods (i.e. the time when there isn’t a tenant in the property between tenancies) are an important factor and those properties at the cheaper end of the rental spectrum can suffer higher void periods too. Apartments can also have service charges and ground rents that aren’t accounted for in these gross yields. Landlords can also make money if the value of the property goes up and for those Aylesbury landlords who are looking for capital growth, an altered investment strategy may be required. It is very much a balancing act of yield, capital growth and void periods when buying in Aylesbury. Every landlord’s investment strategy is unique to them. If you would like a fresh pair of eyes to look at your portfolio, be you a private landlord that doesn’t use a letting agent or a landlord that uses one of my competitors – then feel free to drop in and let’s have a chat. James Taylor, 34-year-old father of two from Aylesbury, was out house hunting. It was a pleasant August Saturday afternoon, and our man cycles along on his bike. He cycles up a street, where he spots a few retired mature neighbours, chatting to each other over the garden fence. He leans his bicycle against a lamppost and launches softly into his property search. James, like many Aylesbury people born in the late 1970’s to the early 1990’s, is keen to get a slice of prime Aylesbury real estate. Yet people like James in Generation Y (or the Millennials as some people call them i.e. born between 1977 and 1994 and needing family housing now) are discovering, as each year passes by, they are becoming more neglected and ignored when it comes to moving up the property ladder. However, the biggest drop has been in the 18 to 24-year old’s, where homeownership has dropped from a third (32%) in the 1980’s to less than one in ten (8.9%) today. 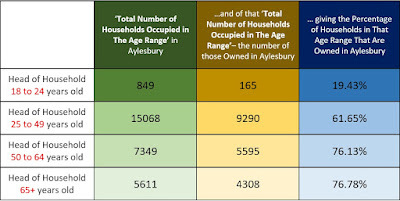 Looking at the Aylesbury statistics, the numbers make even more interesting reading. So, what is my point? Well, all I would say to the homeowners of Aylesbury is that one solution could be to start to talk to your local councillors, so they can mould the planners’ thoughts and the local authority thinking in setting land aside for bungalows instead of two up two down starter homes? That would free the impasse at the top of the property ladder (i.e. mature people living in big houses but unable to move anywhere), releasing the middle aged gridlocked people in the ladder to move up, thus releasing more existing starter homes for the younger generation. 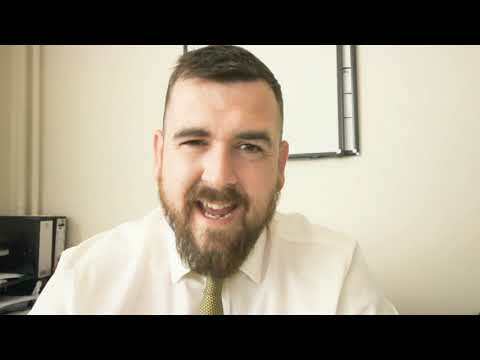 … and to you James … the wandering new home searcher – if things are going to change, it will be years before they do .. so keep going out and spreading the word of your search for a new home for your family. I find the most interesting bits in newspapers are their commentaries on the British Housing Market. Some talk about property prices, whilst others discuss the younger generation grappling to get a foot-hold on the property ladder with difficulties of saving up for the deposit. Others feature articles about the severe lack of new homes being built (which is especially true in Aylesbury!). A group of people that don’t often get any column inches however are those existing homeowners who can’t move! In 2007, 4,453 properties sold in the Aylesbury Vale District Council area and last year, in 2016 only 3,819 properties sold – a drop of 14.24%. 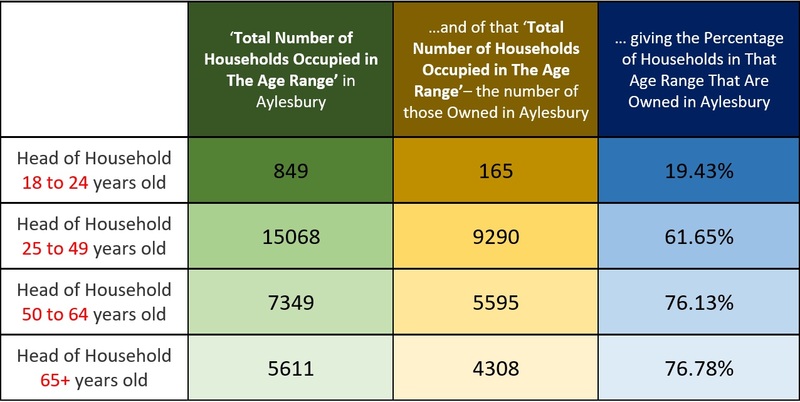 Therefore, we have just over 630 less households moving in the Aylesbury and surrounding Council area each year. Now of that number, it is recognised throughout the property industry around fourth fifths of them are homeowners with a mortgage. That means there are around 520 mortgaged households a year (fourth fifths of the figure of 630) in the Aylesbury and surrounding council area that would have moved 10 years ago, but won’t this year. 1. There are around 187 households a year that aren’t moving due to a fall in the number of mortgaged owner occupiers (i.e. demographics). 2. I then estimate another 73 households a year are of the older generation mortgaged owner occupiers. 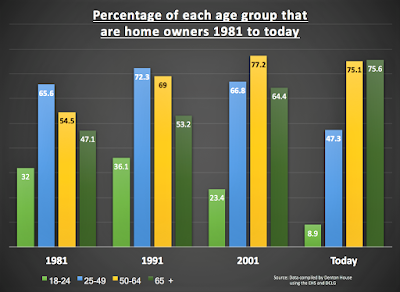 As they are increasingly getting older, older people don’t tend to move, regardless of what is happening to the property market (i.e. lifestyle). 3. Then, I estimate 31 households of our Aylesbury (and surrounding area) annual non-movers will mirror the rising number of high equity owner occupiers, who previously would have moved with a mortgage but now move as cash buyers (i.e. high house price growth). 4. I believe there are 229 Aylesbury (and surrounding area) mortgaged homeowners that are unable to move because of the financing of the new mortgage or keeping within the new rules of mortgage affordability that came into play in 2014 (i.e. mortgage). The first three above are beyond the Government or Bank of England control. However could there be some influence exerted to help the non-movers because of financing the new mortgage and keeping within the new rules of mortgage affordability? If Aylesbury property values were lower, this would decrease the size of each step up the property ladder. This would mean the opportunity cost of increasing their mortgage would reduce (i.e. opportunity cost = the step up in their mortgage payments between their existing and future new mortgage) and they would be able to move to more upmarket properties. “What’s happening to the Aylesbury Property Market” is a question I am asked repeatedly. Well, would it be a surprise to hear that my own research suggests that there isn’t just one big Aylesbury property market – but many small micro-property markets? 1. ‘lower’ Aylesbury Property Market. 2. ‘lower to middle’ Aylesbury Property Market. 3. ‘middle’ Aylesbury Property Market. The ‘lower’ and ‘lower to middle’ sectors of the Aylesbury property market have been fuelled over the last few years by two sets of buyers. The first set, making up the clear majority of those buyers, are cash rich landlord investors who are throwing themselves into the Aylesbury property market to take advantage of alluringly low prices and even lower interest rates. The other set of buyers in the ‘lower’ and ‘lower to middle’ Aylesbury property market are the first-time buyers (FTB), although the FTB market is in a state of unparalleled deadlock as it’s been trampled into near-immobility and incapacity by the new 2014 stricter mortgage affordability regulations and also fewer mortgages with low deposits. …. and if one looks at the figures for Aylesbury Vale District Council area you can see the three different sectors (lower, lower/middle and middle) have performed quite differently. You can quite clearly see that it is the ‘lower to middle’ market that has performed the best. You might ask, what do all these different figures mean to homeowners and landlords alike? Quite a lot – so let me explain. The worst performing sector (with the lowest Percentage uplift) was the ‘middle’ housing market. Therefore, interestingly, if we applied the best percentage uplift figure (i.e. 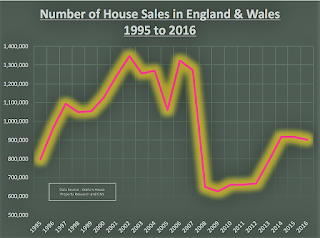 from the ‘lower to middle’ market percentage uplift), to the ‘middle’ 1995 housing market figure, the 2017 figure of £343,829, would have been £374,661 instead – quite a difference you must agree? Now, I have specifically not mentioned the upper reaches of the Aylesbury housing market for several reasons. Firstly, the lower or middle market is where most of the buy to let investment landlords buy their property and where the majority of property transactions take place. Secondly, due to the unique and distinctive nature of Aylesbury’s up-market property scene (because every property is different and they don’t tend to sell as often as the lower to middle market), it is much more difficult to calculate what changes have occurred to property prices in that part of the Aylesbury property market - looking at the stats for the up-market Aylesbury property market from Land Registry, only 46 properties in Aylesbury (and a 1 mile radius around it) have sold for £1,000,000 or more since 1997. So, what should every homeowner and buy to let landlord take from the information that there are many micro-property markets? Well, when you realise there isn’t just one Aylesbury Property Market, but many Aylesbury “micro-property markets”, you can spot trends and bag yourself some potential bargains. As always I look forward to hearing your thoughts, be that by email, or by popping into our temple street office for a chat. Slowing Aylesbury Property Market? Yes and No! The tightrope of being a Aylesbury buy-to-let landlord is a balancing act many do well at. Talking to several Aylesbury landlords, they are very conscious of their tenants’ capacity and ability to pay the rent and their own need to raise rents on their rental properties (as Government figure shows ‘real pay’ has dropped 1% in the last six months). Evidence does however suggest many landlords feel more assured than they were in the spring about pursuing higher rents on their Aylesbury buy-to-let properties. However, several Aylesbury landlords have expressed their apprehensions about a slowing of the housing market in Aylesbury and I believe, based on this new evidence, they may be exaggerated. Property Values in Aylesbury are 7.13% higher than they were 12 months ago, rising by 1.46% last month alone! Yet, I would take those figures with a pinch of salt as they reflect the sales of Aylesbury properties that took place in early Spring 2017 and now are only exchanging and completing during the summer months. The reality is the number of properties that are on the market in Aylesbury today has risen by 48.6% since the New Year and that will have a dampening effect on property value increases. As tenants have had less choice, buyers now have more choice ... and that will temper Aylesbury property prices as we head towards 2018. Be you a homeowner or landlord, if you are thinking of selling your Aylesbury property in the short term, it’s important, especially with the rise in the number of properties on the market, that you realistically price your property when you bring it to the market. It is so crucial as the short-term balance of the local property market see-saw slips more towards the buyer with the increase in the number of properties for sale. Everyone has access to every property on the market now through the likes of Rightmove and Zoopla and they will compare your home with other property like yours. However, even with this uplift in the number of properties for sale in Aylesbury, property prices will remain stable and strong in the medium to long term. This is because the number of properties on the market today is still way below the peak of summer of 2008, when there were 1,305 properties for sale compared to the current level of 602 (if you recall, prices dropped by nearly 20% in Credit Crunch years of ‘08 and ‘09). Compared to 2008, today’s lower supply of Aylesbury properties for sale will keep prices relatively high...and they will continue to stay at these levels for the medium to long term. Less people are moving than a few years ago, meaning less property is for sale. Fewer properties for sale mean property prices remain relatively high and this is because of a number of underlying reasons. Firstly, buy-to-let landlords tend not sell their properties as often as owner-occupiers, consequently removing the property out of the housing market selling cycle. Secondly, Stamp Duty is much higher compared to 10 years ago (meaning it costs more to move). Next, there is a dearth of local authority rental housing so demand for private rented housing will remain high. Then we have the UK’s maturing owner occupier population, meaning these older people are less likely to move (compared to when they were younger). Another reason is the lack of new homes being built in the country (we need 240k houses a year to be built in the UK and we are currently only building 145k a year!) and finally, the mortgage rules introduced in 2014 about how much a person can borrow on a mortgage has curtailed demand. Some final thought’s before I go – to all the Aylesbury homeowners that aren’t planning to sell – this talk of price changes is only on paper profit or loss. To those that are moving ... most people that sell, are buyers as well, so as you might not get as much for yours, the one you will want to buy won’t be as much. Whatever your plans, if you want some impartial guidance or have another topic you would like to discuss, please do contact me at declen@mortimersaylesbury.co.uk or pop in to our Temple Street office.